A4 Size 6.6 x 10.5 in. (168 x 267 mm) 8.3 x 11.7 in. A3+ Size 11.4 x 18 in. (288 x 458 mm) 13 x 19 in. MEDIUM 13.2 x 21 in. (334 x 530 334 mm) 16 x 24 in. LARGE 21 x 33 in. (530 x 840 mm) 24 x 36.5 in. Sathya Sai Baba (1926-2011) was and remains India's most famous, revered, and laterally somewhat controversial miracle-working guru. His charisma, clairvoyance, magnetism and supernatural powers endeared him to literally millions of devotees, especially throughout the Indian sub-continent. But in the West he was often either elevated to the omniscient status of the long-awaited 'Messiah', or demonized - like many other modern teachers and gurus - for his apparent human weaknesses. And a few of his rationalist detractors, the gutter-press, and a biased TV documentary did little to alleviate this dualistic dilemma. However, Sai Baba was genuinely gifted, and as he himself said: "Its always the fruit-laden tree that receives the stones of the passers-by." The most unbiased and systematic research into the phenomena of Sathya Sai Baba is presented in the book, "Miracles are My Visiting Cards," by the late Dr. Erlendur Haraldsson, who was probably the finest paranormal investigator of the last century. In this realistic oil painting by Samundra Man Shrestha, Sathya Sai Baba stands in his typical blessing posture with his right hand raised, and wearing his one-piece orange robe, which definitely had no hidden seams or pockets. In front of his feet is a Shaivite lingam, with a circular stone yoni or 'womb' at its base. The phallic-shaped golden lingam rises from the jasmine-laden centre of this yoni, with the four-faced directional aspects of Shiva Mahadeva appearing amidst incense smoke on its sides. Around Sai Baba's curled Afro-style hair appear the rings of a halo, and behind his upper body is a yantra or 'diagram' that has a central golden dais with sixteen lotus petals, and a fiery outer square or 'bhupura' with four directional gateways. In the background is another haze-filled yantra that is composed of three intersecting fiery triangles, which represents the union of Shiva-Shakti as the recent embodiment of Sathya Sai Baba. For some people it may seem strange to include this portrait of India's most famous, and now somewhat controversial, miracle-working guru in the Hindu Deity gallery of this website. But for countless Hindus of India and Nepal, Sathya Sai Baba has long been recognized as a living embodiment of the divine, and those who came to scoff often ended up staying to pray. This oil painting of Sathya Sai Baba was painted by my dear friend Samundra, whose wife, Davita, is a pure and faithful devotee of Sathya Sai Baba, and if ever a tree were to be judged by its fruit, then this tree is heavily laden, and it is always the fruit-laden tree that receives the stones of the passers-by. Davita's life was twice saved through the intervention of Sai Baba, when she underwent open-heart surgery at his modern hospital in India on two separate occasions. Sathya was born in the village of Puttaparti in the Indian state of Andhra Pradesh in 1926. From an early age he began to materialize items such as fruits, flowers, sweets and pencils for his school friends. But at the age of fourteen he underwent a profound transformation after being bitten by a scorpion, when he renounced his home and declared: "I am no longer your Sathya. I am Sai Baba. Maya (illusion) has gone, my devotees are calling me and I have work to do. Stop trying to cure me, for I am Sai and do not consider myself related to you." His identity as 'Sai' was in reference to Shirdi Sai Baba, who was then a little known miracle-working and enigmatic 'fakir' who died in 1918, but is now recognized as one of India's greatest and most beloved spiritual masters. Sathya Sai thus identified himself as the second incarnation of Shirdi Sai, and predicted he would live to the age of ninety-six, dying in 2022. Then eight years after his death he would take rebirth in his third bodily incarnation as Prema Sai around the year 2030. Only time will tell if this prophecy will come to fruition, but Sathya Sai has already recognized the parents of his future rebirth, and also materialized photographs of himself as Prema Sai. The modern Indian 'rationalist movement' has long sought to discredit Sathya Sai Baba as a fraud, particularly in regard to his manifestation of sacred-ash (vibhuti) and the various 'trinkets' he produces from the palms of his hands. But 'sleight of hand' is not an adequate explanation when specific objects are frequently produced on demand, such as out of season fruits, fresh Indian sweets and curries, anomalies of nature, teleported artifacts, medicines, and photographs of deceased relatives. And these are not isolated occurrences, for it has been estimated that on average Sai Baba materializes about forty different items of jewelry every day, and sometimes up to several kilograms of vibhuti. Large quantities of vibhuti and vermilion powder also frequently manifests on devotees shrines all over the world, along with honey and nectar (amrita) that oozes from sacred pictures and statues. Unfortunately the Internet is now rife with character assassinations of Sathya Sai Baba, with a vengeance that almost equals one of the epic wars described in the Mahabharata. However, much of this material is speculative and ill informed, especially where Sai Baba's miracles are concerned, for these miracles have been experienced by literally millions of people, myself included. I would recommend that anyone who seeks to understand the nature of these 'miracles' should read "Miracles are My Visiting Cards," by the late Dr. Erlendur Haraldsson, who was one of the most experienced and unbiased investigative researchers into psychic phenomena of the last century. 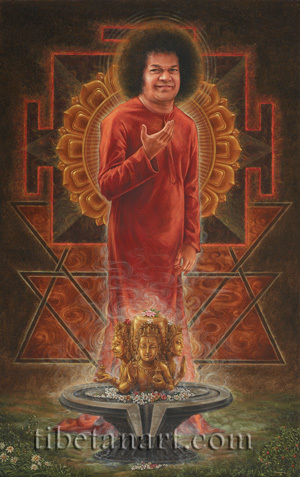 In this painting Sathya Sai Baba stands in his typical 'darshan' posture, with his right hand raised and his left hand resting at his side, and wearing his traditional one-piece orange robe, which has no hidden seams or pockets. In front of his feet is a Shaivite lingam, with a circular stone yoni or 'womb' at its base that has a frontal drainage channel for rituals of ablution. The phallic-shaped golden lingam rises from the centre of the yoni, with the four aspects of Shiva Mahadeva appearing on its directional sides. The eastern face at the front represents Tatpurusha, who is peaceful and holds a rosary and water-pot in his right and left hands. The southern face (left) represents Aghora, who is wrathful and holds a water-pot. The unseen western face (rear) represents Sadyojata. And the northern face (right) represents Vamadeva, who is peaceful and makes the abhaya-mudra of fearlessness. Small white jasmine and red hibiscus flowers are strewn over the lingam, and incense smoke billows upward from the ground. Around Sai Baba's curled afro-style hair appear the rings of his halo, and behind his upper body is a yantra that has a central golden dais with sixteen lotus petals, and a square bhupura with four directional gateways. Below the bhupura is another yantra that is composed of three intersecting fiery triangles, which represents the union of Shiva-Shakti as the present embodiment of Sathya Sai Baba.